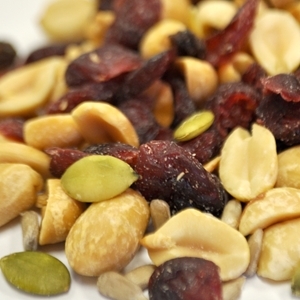 Cranberry Nut Snack Mix sold in 25 pound containers. INGREDIENTS: PEANUTS (WITH PEANUT OIL, COTTONSEED OIL, SALT), DRIED CRANBERRIES (WITH SUGAR, CITRIC ACID, SUNFLOWER OIL, ADDED COLOR), SUNFLOWER SEEDS, PUMPKIN SEEDS, RAISINS (SUNFLOWER OIL). ALLERGEN INFORMATION: CONTAINS PEANUTS. CAUTION: MAY CONTAIN SHELL OR SHELL FRAGMENTS.